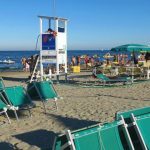 The name Milano Marittima evokes immediately the image of sun, sea and fun for the young, thanks to the large number of night spots frequented by many famous sport and entertainment personalities. This seaside resort attracts a “tourism of elite”. The locality of Milano Marittima originated quite recently: at the beginning of the 1900’s. The nearby town ofCervia had only about 9000 inhabitants at the time and its economy was based mostly on the production of salt, on agriculture and fishing. 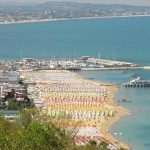 Around the end of the 1800’s the first “pioneers of tourism” were attracted to the wild and fascinating territory of the Romagna Riviera which was, however, tormented by malaria. With the construction of the railway (the Ravenna-Cervia leg in 1884 and the Ferrara-Ravenna-Rimini stretch in 1889) the territorial conditions, from a hygienic and sanitary standpoint, improved enormously and in the nearby Cervia the very first bathing facilities were inaugurated. In 1907, an influential family from Milan, the Maffei’s obtained permission from the Town of Cervia to reclaim and build on a large area situated north of the Cervia canal. 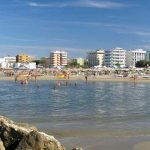 In 1911, the “Milano Marittima Society for the development of the beach in Cervia” was founded. Various famous personalities of the upper middle class in Milan, including the painter and commercial artist, Giuseppe Pallanti, participated in the venture. In fact, it was Pallanti who presented an original urbanistic project, a sort of Garden City, a resort spot where the vacationers’ residences blended into the surrounding natural ambient. Thus, a vacation city with villas and residences, aimed at the high middle-class Lombard market, was integrated into the existing, suggestive, pine grove. These villas (including Pallanti’s vacation home) can still be admired today. Further urban development continued in the 1920’s and 30’s. The activity was interrupted by the Second World War but picked up again, more intensely thereafter, reaching the size of the seaside resort today. An interesting side-trip while in Milano Marittima is a visit to the “La Casa delle Farfalle” (The House of Butterflies). Founded with the intention of familiarizing a large public with the fascinating world of multicolour and multiform insects. The House offers a didactic presentation by means of an itinerary passing through two structures: an enormous 500 sq.meter greenhouse and a multifunctional facility. Visitors can admire this surprisingly magical world up-close: the world of thousands and thousands of delicate, elegant multicoloured butterflies. Some of the most famous night spots in Milano Marittima are Club Pineta, Acetodivino at Le Indie, Barrumba, Caino, Cotton Extra Club (Masha Key), Harley Café, Hype Café, Idroscalo, Milano Café, Pacifico Dinner Lounge, Papeete – to name just a few. Spring and summer seasons attract a high number of tourists, thanks also to the nearby amusement park “Mirabilandia“. 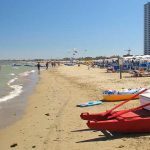 In recent years Milano Marittima has become more and more the ideal vacation resort for famous personalities and young adults. Italian soccer aces such as Vieri and Inzaghi are often seen in the night spots. As a result we find the most modern and comfortable hotels vying to draw the most famous vacationers to their facilities.